The Problem: Thousands of seniors struggle to afford their healthcare. Many cut back on other necessities in order to pay for prescriptions, premiums, and, co-payments. Medicare provides a foundation for health security to people 65 and over, but for far too many, the out-of-pocket costs and coverage gaps are severely burdensome. Massachusetts has been recognized as a national leader in healthcare reform, but these advancements left seniors behind. Seniors spend on average three times as much of their income for healthcare than their younger counterparts, and out-of-pocket spending continues to increase with age. Individuals 85 and over spend more out of pocket than any other age group, and women spend more than men despite having lower average incomes. Congress has created opportunities for states to streamline enrollment and expand eligibility to assistance programs. Unfortunately, the current eligibility standards in Massachusetts prohibit those who need the most assistance from accessing the programs. 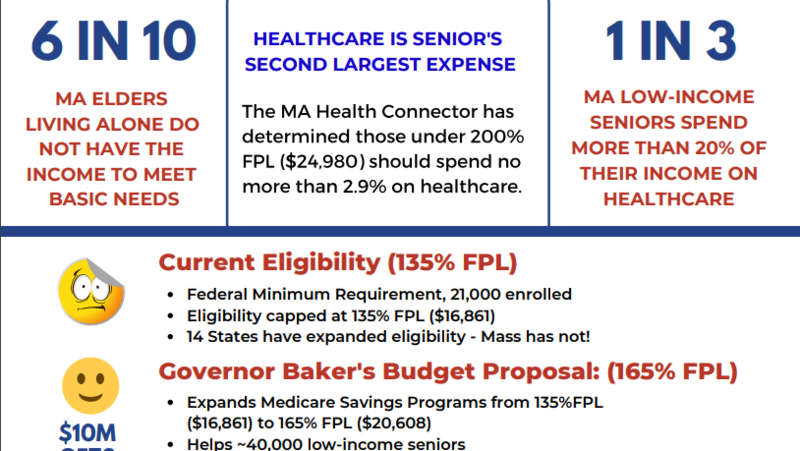 Eleven other states, including Mississippi, Alabama, Arizona, New York, and Connecticut, have expanded access to federal programs that help seniors with Medicare costs - Massachusetts has not! Eliminate the asset test for the Medicare Savings Programs, and raise the income eligibility to 300% FPL ($35,010). Increase MassHealth’s asset and income eligibility limits for MA residents age 65 and over. Simplify the application process to reduce barriers to assistance for seniors. Ask your State Senator and State Representative to support expanding Medicare Savings Programs and MassHealth (HB.1199, HB.1200, SD.741). My name is Carrie. I am 84 years old, and I have lived in Mission Hill since 1966. I have a monthly income of $549. A few years ago I lost MassHealth because I was told my life insurance policies and the little I had in the bank added up to just over the $2,000 asset limit. Looking back I think they made a mistake, but I didn’t know how to appeal. As a result, I really struggled to afford my health care, and I nearly lost my life because the out-of-pocket costs were too much. I have a number of health conditions, including severe asthma, diabetes, gout, and I am a heart failure patient. When I lost MassHealth I could not afford the inhaler that helps manage my asthma. It costs over $200, which was more than a third of my income. I was just about to run out when a friend of mine passed away, leaving me two full inhalers. I was relieved to get the inhalers, but I felt horrible that it was because my friend passed. Then I almost lost my life. On a Monday about two years ago I got a routine colonoscopy, and when I got home I started having chest pains. As a heart failure patient, I immediately knew to call the ambulance. I was kept overnight, received treatment, and returned home the next day to find an ambulance bill for $1,700! That is more than three months of my income. I was terrified; there was no way I could pay it. Instead, I took the time to wait for my daughter-in-law to drive me. Once at the hospital, I had to stand in a long line to check in. Suddenly, I could feel the rush of blood coming again. I stepped off the carpet so I wouldn’t stain it and leaned up against a post. A security guard came to ask if I was ok. I told him I was bleeding as I began to slump to the floor. Next thing I knew, there was a swarm of people around me and I was bleeding everywhere. They rushed me in and I ended up in the ICU for several days. If I had gotten to the hospital any later, I could have died. Expanding MassHealth for lower income seniors is not just about making healthcare more affordable, it is about saving lives. I was too scared to call the ambulance, and as a result came inches away from death. I hope that by sharing my experience we can make sure this does not happen to anyone else. I ask you to please bridge the gap to affordable care for seniors. Thank you. My name is John. I am 66 years old, and I live in disabled/elderly housing in Somerville. Despite being born blind in one eye and visually impaired in the other, I have always worked hard to provide for myself. After cleaning railway cars for over 20 years, I retired on disability at the age of 62 – in part so I could help care for my ailing parents. When I retired, my income was about $1500 per month, and I was able to access healthcare coverage through Commonwealth Care. I paid $62 for my monthly premium and had $10 copayments for doctor’s visits. For the most part my healthcare needs were covered. However, when I turned 65 I fell off the “senior health care cliff.” I was cut off from Commonwealth Care and found myself lost in the Medicare swamp. I didn’t know how to choose from the over 100 programs, and I didn’t know how I was going to afford it. Now my income is slightly less than when I was under 65, but I pay 10 times more for my health care. In total, I’m now paying over $550 each month for my healthcare, compared to the $60-$80 I paid before turning 65. And because Medicare does not cover dental, I have to pay $2,300 for an upcoming dental surgery. I have no savings, and since my income is stretched I have to go to church dinners and food pantries to make ends meet. Sometimes I have to rely on credit cards for groceries and other daily essentials. I am going into serious debt because of my healthcare costs. If H.988 passes I will qualify for MassHealth Senior Buy-in, and my monthly Part B Premium will be covered. With an extra $104.90 in my pocket, I can start paying off my dental surgery, credit card debt, and other basic needs. It will make a huge difference. My name is Karen, and I am a 70-year-old retired nurse. I have lived in Malden for 16 years. Since turning 65, I feel like I am one healthcare catastrophe away from being unable to support myself and my foster child. I had thought that Medicare would cover my needs, but I hadn’t realized how much even routine care would cost. I remember being shocked when they started deducting $104.90 from my monthly check to pay Medicare Part B. No one had told me this was going to happen! I kept working until I turned 69 so I could stay afloat, earning $27,771 a year, but eventually I had to stop working. At almost 70, I was too tired physically and emotionally to work while also taking care of my foster child. When I retired, everything changed. My income was nearly cut in half (to $1,600/month), but my monthly healthcare costs increased. I had to start paying another $100 per month for supplemental insurance to cover what Medicare didn’t and an additional $60 per month out-of-pocket for prescriptions. I’ve had to make sacrifices to make ends meet. I use my car less, which I’ve been using to drive Malden seniors to community events and meetings, and if it breaks down I won’t have the money to fix it or to buy another one. In the winter I have to leave the heat down lower than I’d like. This new phase of life is full of economic questions. I was a nurse for a long time, and I’ve seen what happens to people when they can’t afford the care they need. I feel like I’m living on the edge. There are so many seniors who are struggling even more than I am. I really think it is time for Massachusetts to help make healthcare more affordable for seniors. If the Medicare Savings Programs were expanded I would be able to get help paying for Medicare Part B, and I could get help with my prescription costs from Social Security. I could breathe just a little easier and worry less. There thousands of seniors who are unfairly struggling to afford their healthcare. Massachusetts: don’t leave us behind, bridge the gap to affordable healthcare for seniors.